Our developers are working on the resource tycoon point problem now. Thanks for your understanding. Compete for Apocalypse and Super Armament Chest! 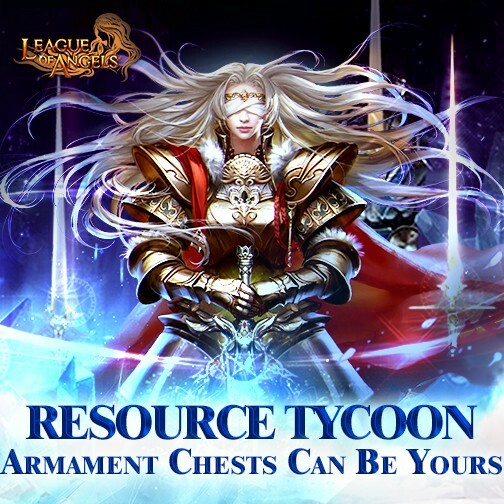 Make your mount the emperor of all mounts through this resource tycoon event. Seize the chancde to collect as many resources as possible as you can. Tip: You can find hot resources inNavigation King and Lucky Tree. Many different totems, Magic Mount Soul (which is essential in Stable Craftwork), Godsend(which is useful in Godsend) and Source of All Souls(which is necessary to upgrade your Amulets) are available in Navigation King. If you want to make your angels even more powerful, vaious kinds of Angels Artifacts are on sale in Lucky Tree! Description: Collect the required resources to win Apocalypse's Icon, Super Armament Chest(Mythic),Knight Emblem(10#)(which gives great stats to your Amulets), Lvl. 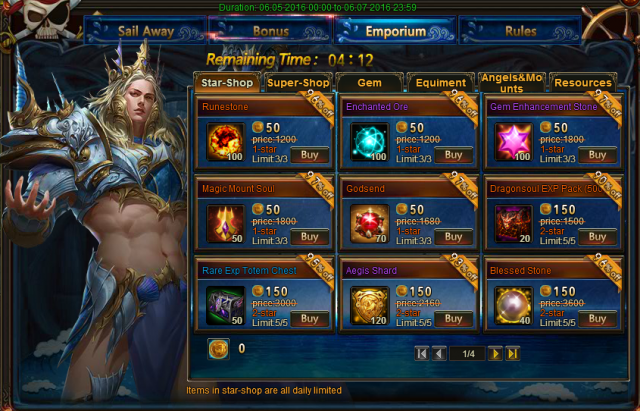 11 Cherubstone, Eostre Awakenning Stone, Luminous Steed and many other rare items!Hope you will like it. Friendly Reminder: There will be Time-limited Resources during Resource Tycoon event. "Consuming, Regaining" event will be available from June 7 to June 9(server time). - For players of previous servers, you can gain points by collecting required resources during the event, i.e. Spirit Essence, Grotto Heart, Element Scroll, Skill Book, Angel Tears, Runestone, Blessed Stone, Seraph's Stone, Aegis Shard, Soulstone, Gold, Enchanted Ore, Gems and Gem Enhancement Stone. - For players of newly opened servers, you can gain points by collecting required resources during the event, i.e. Spring of Wisdom, Angel Tears, Runestone, Refiniing Stone, Element Crystal, Blessed Stone, Seraph's Stone, Aegis Shard, Soulstone, Gold, Enchanted Ore, Gems and Gem Enhancement Stone. 2.Death How Shard(the exclusive amulet for Hecate), Heavenly Blade Totem(Garnet) (the newly added totem)are available in Emporium. 3. Amazon Soulhunter, Ocarina, Shadow Phantom, Phoenix, Tusky, Persian Cat, St. Patrick's Attire, Little Red Fashion, Golden Attire will also be there. 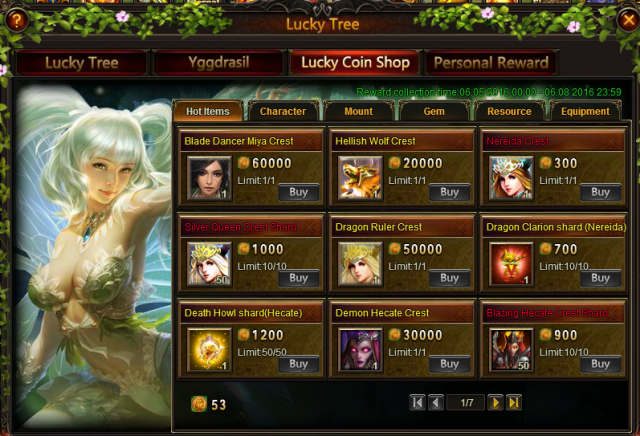 2.You still have a chance to get Demon Hecate and her exclusive amulet in Lucky Coin Shop. 3. Dark Knell(Legendary), Heaven's Melody(Legendary), Khaos Compass(Legendary), Purgatory Wand(Legendary) and Shield of Discord(Legendary) are on sale this time! It's a great opportunity to make your angels more powerful! 4.Snow Warden, Messenger of Darkness, Bone Dragon and Golden Hamster are waiting to join your party. 5. God's Trial Blitz Card (which is useful in God's Trail) and Godsend (the essential material for Godsend system), are available now! More exciting events are coming up through June 5 to June 10 (server time). Check them out in the in-game Hot Events menu now!